So third time’s the charm means the third time you try something it will work out (you will succeed). By the way, we also say “third time lucky” in English to mean the same thing. Before her match, Li Na was asked if she’d be “third time lucky” in the final and she replied, “In China, 6 and 8 are lucky.” I guess it’s a good thing she was playing in Australia and not in China that day! If you haven’t seen her victory speech then you have to watch it (see video below). 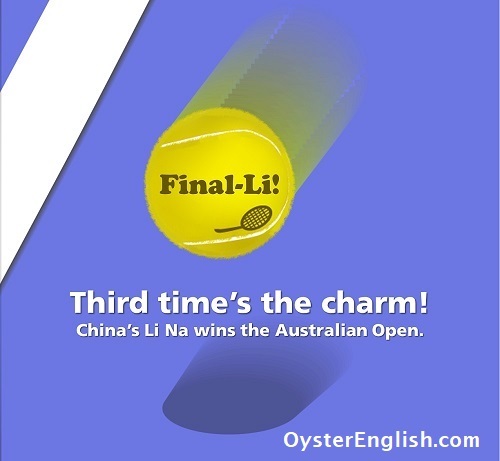 Li Na is Chinese so English is her second language and she did very well with her speech. Congratulations Li Na! Well done! I applied for a job with the United Nations three years in a row and finally got offered a job. As they say third time lucky! Most people give up the first time they fail. Too bad they forget that third time's the charm. Even though I've already failed the exam twice before, I continue to remind myself that I'll be third time lucky. We've had two unsuccessful product launches but after incorporating feedback from our customers, I think we'll be third time lucky next time. After two strikes, the baseball batter was third time lucky and hit a home run. My newly-engaged 27 year-old daughter has already divorced twice so I really hope third time's the charm. The first two buyers backed out at the last minute so let's hope we're third time lucky. Your turn to use the idiom "third time lucky"